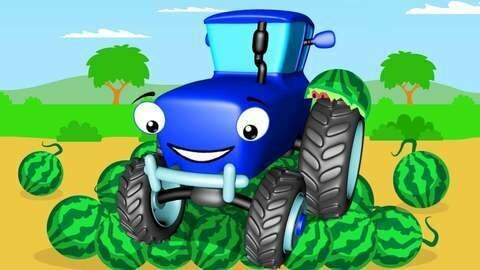 In this car cartoon for toddlers, a Blue Tractor crashes into a tree because the bees are chasing it. The bees are attracted to the watermelon and the blue monster truck speeds up to avoid it but crashes in a tree. Luckily, the purple monster truck and the crane rescued him. Keep on watching funny car cartoon videos in SeeZisKids.com.